Hamilton Tennis Club’s ladies’ third team of Jude Plumb, Linda Hallam, Chris Stevens and Nicky Herbert shaded Loughborough Thirds by five sets to three. Jude and Linda led the team with three sets, while Chris and Nicky completed the win with one set against each pair. Hamilton’s ladies’ first team of Jessi Jackson and Margaret Roskell, and Tracy White with Rosie Gildove were glad to get back into action, after being rained off in recent matches, and whitewashed Market Harborough Seconds 8-0. 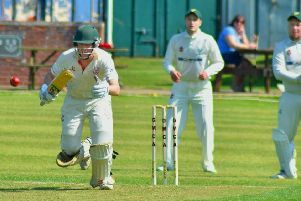 * The men’s third team of Mark Ashman and Fraser Rabbit-Dalby, and Edwin Shufflebotham with Craig Tracey gained their best result of the season with an 8-0 win over Victoria Thirds. Hamilton’s men’s fourth team continued their run of good form with a 6-2 win over Welland Park Seconds. Both pairs of Steve Plaistow and Stuart Posnett, and Graham Brown with Patrick Whenham-Bossy won three sets each. The men’s first team of Joe Jackson and Andy Douglas, and Jimmi Cox and Will Harrison lost 5-3 to Westfields Firsts, despite three solid set wins from Joe and Andy.